Some packets my husband Matt made for his Shadowvale character. Many live-combat LARPs in the New England area — in particular in the Accelerant system — use packets to represent both spells and arrows. These are basically little mushroom-shaped beanbags made out of birdseed and knit fabric. For something so simple, they sure do occasion a lot of discussion. 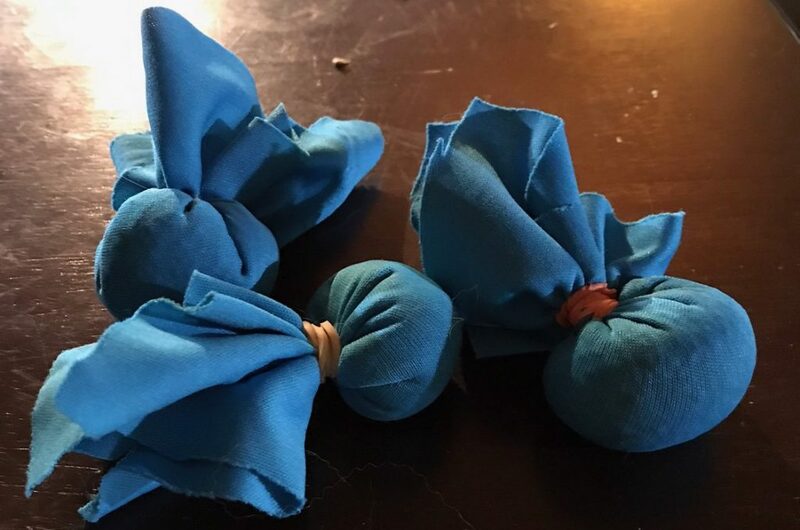 While I’m still kind of new to the boffer larp scene, in a short time I’ve developed Opinions on packets, and I’m going to share them with you. I’m also dimly hopeful this will prove useful to those of you just starting out! Packets have strict construction guidelines. That leaves us with some questions, doesn’t it? Packets – Packets are small bean bags that are thrown to represent magical attacks, arrows, or special powers. They should be made of stretchable fabric and filled with birdseed. You should use only small birdseed with no larger or sharper seeds. A square of fabric is pulled around the birdseed and its corners are gathered together to form a “tail” and closed up with a rubber band, string or tape. You may also sew a packet shut. Crossover has some very similar rules, too. There are a few important points here, and it’s vital to understand why they’re important, so you know where you can skimp if you need to. I feel strongly that you should use knits. Knits are going to lend the packet more “give”, which means it won’t hit your target with too much force. (This is especially important if you’re using one of the newfangled packet bows, which hit with a great deal more force). They’re also less prone to fraying, so your packets are less likely to fall apart. I also personally feel they fly better, as knit fabrics are better at forming the birdseed into a regularly-sized ball. This is what I end up concluding after seeing the VAST NUMBER of packets made out of muslin, so allow me a few moments to explain what I think is happening here, what the difference is between woven and knit fabrics, and why it matters for making packets. I think the less fabric-savvy packet makers go to Jo-Ann’s, looking for what’s cheap, and beeline for the muslin and cotton broadcloths. They pull on the corners and say, “hey, that has stretch,” because they’re probably pulling it along the diagonal, or bias. ALL fabric, even woven fabric, has stretch along the diagonal, and that is NOT sufficient stretch for packets. A woven fabric is woven on a loom of some sort. It has warp thread and weft threads which terminate at the horizontal and vertical edges of the fabric. As a result, when the edges are cut, the component threads start to fray off. A knit fabric is, well, knitted. Imagine a more industrial version of something you’d knit for yourself. Instead of a warp and weft, it is one continuous thread that is brought through the piece of fabric. In traditional knitting, if you cut through the body of the work, the whole piece will begin to ladder, like a rip in a pair of stockings. Commercial knit fabrics mostly don’t do this (for some magical reasons I don’t understand), but they do roll at the edges when cut. In this case, that’s actually desirable. Again. You need knits. Wovens will not do, even wovens that incorporate a bit of some stretchy material. In a fabric store knits are usually housed in a completely different section than the wovens. Look for the swimsuit and leotard material and you won’t be far off. You need a square in order to make a tail — it’s a lot harder to work with a rectangle. I’ve never tried working with a circle, but it might work. But either way, radial symmetry is important for forming the tail. There’s some room for variation in size, within the rules of your particular game. I actually tend to cut my squares a bit wider than Chris does (5 1/2 to 6″ square), because my hands are small and I need long-ish tails in order to hold a good number in my hand at a time. On the other hand, packets made for packet bows do better with a shorter tail. I think the only thing a long tail affects is how the packet flies, so if you make the tail too long or too short, really, the only person who’s going to be suffering is you. At this point, we’re going to assume you know you should use birdseed, and not, oh, fishing weights, or buckshot, or any of those things that cropped up in the Bad Ol’ Days of Larping. (Yes, for real. If you want to hear some horror stories of weapon/packet construction gone horribly wrong, corner an old timer at a larp sometime and ask). In general, you want the birdseed you use to not be pokey, because it will come flying at your target at a decent speed. Thistle seed? (which makes up most commercial birdseed mixes)? Eh. It’s small, so probably not a big danger, but it’s also, well… thistle-y. I prefer not to use it. Another bad choice? Cracked corn, or cornmeal, or really anything having to do with corn. In particular this stuff hardens like a rock when it gets damp and then dries. Packets — which are thrown around outside in all kinds of damp and dry whether — are especially likely to do this. You can filter the “bad” seeds out of a mix with a sieve, like Chris’ guidelines suggest, but if you value your time more, I recommend buying 20lbs of white millet birdseed on Amazon. It’s $28 and will make, by my estimation, 480 to 600 packets. It depends how quickly you use the packets, of course, but that might well be enough for an entire three-year campaign. Chris’ guideline says “2 to 3 normal spoonfuls”, but I admit that level of imprecision doesn’t work for me. Does he mean tablespoons or teaspoons? Are they level, or heaping? I have an 1/8 cup measure I use for this, which I usually fill to about 80% for each packet. Experiment to get the size you want, within the guidelines for your larp. Use rubber bands. I can’t imagine anyone going to the mess and trouble of sewing these things closed. Tape comes undone, or tears, or gets wet and falls apart. String comes untied. Tiny hair elastics might work, too, but I feel like they’re more likely to break, and they’re probably more expensive, to boot. … is an “eyeball it”/”doesn’t matter too much” situation. You’ll get a feel for how many wraps of the rubber band will make the packet too tight, how to fold the fabric so you don’t lose seeds, etc. This part is very personal. The muffin tin method: Basically each cup of a muffin tin holds your fabric square and birdseed until you’re ready to fold it and tie it. Handy to keep birdseed from getting everywhere. A rotary cutter, self-healing mat, and plastic grid ruler (standard quilting tools) will make cutting squares of fabric much, much easier. Matt and I have color-coded our characters’ packets before, to make them easier to recognize as yours when you’re cleaning up at the end of an event. Except, of course, if another player uses the same color as you. I have also heard it said that a good packet should fit in a film canister. Who can remember what a film canister looks like? Funny story – the film canister thing (or so I am told, this is way before my time) comes from a time when packets were filled with cornstarch and/or baby powder, possibly made with tissue paper, and were supposed to explode on impact. So people actually stored them in film canisters to keep them safe until used. Eventually it became a standard of measurement? I guess? Agree about the knits (and everything else) – I try to get the “slicker” textured fabrics also because they tend to pick up less dirt and leaves. Also seconding bright colors – neon stuff is easier to spot hiding in grass and easier to find at night. I like doing packets in assembly line mode with (a) fellow LARPer(s), while watching TV or listening to music. So I dont play casters generally, but don’t remember ever seeing packets made out of muslin. Mostly I think people go for bathing suit material and knit fabrics.